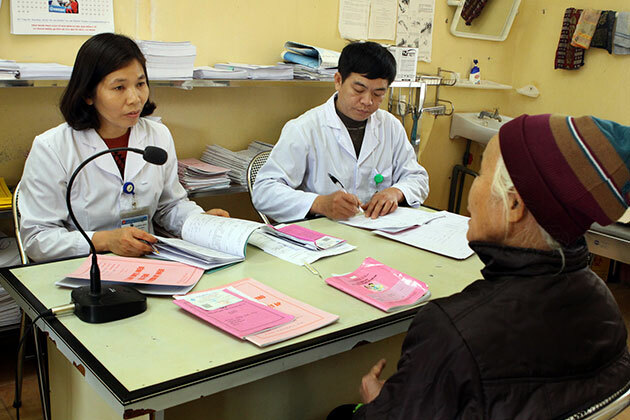 Health insurance covered 81.7 percent of Vietnam’s population in 2016, 2.7 percent higher than the target set by the Prime Minister, according to the Vietnam Social Security (VSS). As of December 31, about 75.9 million people were covered by health insurance, VSS Deputy General Director Nguyen Minh Thao said at a meeting on administrative reforms and setting tasks for 2017 on January 3. He said the insurance sector paid medical expenses for 144 million times in 2016, a year-on-year increase of 10.8 percent. The estimated 69.41 trillion VND (3.05 billion USD) paid by insurance exceeded the medical insurance fund by 5.13 trillion VND (225.7 million USD). Many localities blamed the exceeding on the scheduled increase of healthcare service fees and frauds made by both insurance buyers and medical establishments. Thao said last year, the VSS and its local agencies stepped up streamlining administrative procedures and applying information technology. While the number of administrative procedures has been reduced to 32, it now takes businesses only 45 hours per year to work with the social insurance bodies to process relevant procedures. The sector is set to push forward with administrative reforms and IT application in 2017 to develop a modern, professional and effective social insurance system. Social, health and unemployment insurance covered a total of 76.1 million people last year, rising by 5.9 million from 2015. Up to 12.9 million people participated in mandatory social insurance, and 203,000 others bought voluntary one. Unemployment insurance covered 11.1 million people./.